He’s hard to get a picture of because normally he is streaking around at faster-than-the-human-eye-can-track speeds. 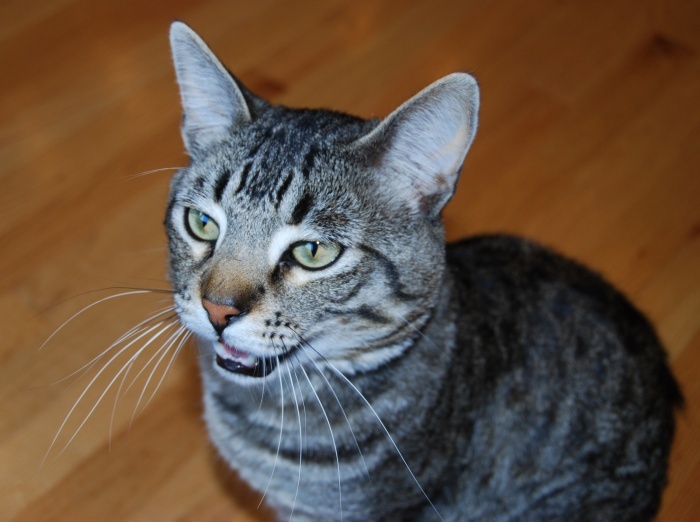 He’s also a bit of a talker; this picture caught him in mid-meow. You might have also seen Ozzie in his two-second debut on Google Video. Last summer when I was doing my video series I needed a test video to upload and Ozzie obliged. Not enough pet choices! I have pet hermit crabs – they’re the perfect office pet! Is that poll thing a plugin, Matt? Ha ha, I had no ideea GoogleBot can be someone’s pet. One would be very fortunate to have GoogleBot as a pet :)). Can I get one from the local PetStore? Hamster are fine pets when you work at night. He wakes up when the sun goes down. I’m definitly a Hamster-type. Dogs… First i had a Yorkshire.. too small for me. Now I ve champi. My friend allready for 9 years: Champi. We have two cats – Holly and Daisy. I have a Nabaztag/tag (http://www.nabaztag.com/en/index.html) From time to time he reads me bits of your blog! Brian, your link killed me. Matt, your cat looks very similar to my childhood Siamese cat named Janie. I was actually raised by Janie. For years I thought she loved me so much when I was sick that she would curl up on my head to protect me. It wasn’t until decades later I realized she just liked the heat from my fever. The vote box is cool! How do you integrate this into wordpress? Nice cat. I have a wireless mouse. I currently have two cats and a dog, and we’re actually looking into breeding Ocicats. They’re certainly interesting creatures to say the least. Ozzie looks very nice. Now let’s see some pictures of him at work, Matt! She sleeps on a mat next to my monitor, but whenever, and I mean every time, I quietly turn on the Chopin, (Berceuse Op. 57) she wakes up and flops right in-between me and the keyboard in fruity mode. Curious, I ran a control trial using the Mazurka in F maj instead. She either stayed asleep, or left the room. Months later our traffic is down to 30 G referrals a day. This on a NFP, clean site. Not even a clue why, from G.
Would really appreciate you checking it out Matt. Great Pic.. I’ve got a Child. Does that count? Actually, I really love cats…but just kept finding them dead (guess the neighbourhood does not) so I got me a poodle. Got a border collie … Luke. Scared of all human except myself, roommate and her mom. Shelter dog. But I was debating between that and Googlebot. Makes a fine pet. Hmmm … wonder if Google could market that? Why dont you film your cat and place him here from youtube? Nice looking cat, I think Ozzie needs to meet my Ragdoll named Princess! Regarding the strange behaviour from ne1home, Princess sleeps on her back with all four legs in the air. When she first did it as a kitten, we thought it was fantastically funny — then it stuck and it makes my wife and I smile every time we see her do it. Not to mention that she also fetches like a dog, that video was taken when she was only a kitten and was still learning. She is about 15 months old now and we’ll play fetch in blocks of 10 minute intervals regularly, hell – she brings her toys into the bedroom of a morning for us to start the game! My wife collects stuffed bears… I guess they are our pets 🙂 As far as my Googlebot pet, I try and feed it every day! We have one cat and one dog in our home. Suppose that says something about our decision making abilities? We have a Pomeranian named Cujo. Nice idea I remember when netscape did a plush version of the lizzard logo – that was back in the day when netscape fitted on a 1.44 floppy. Multi-Worded Adam, it’s a plug-in called Democracy. I saw the Shoemoney recommended it, so I figured I’d try it. 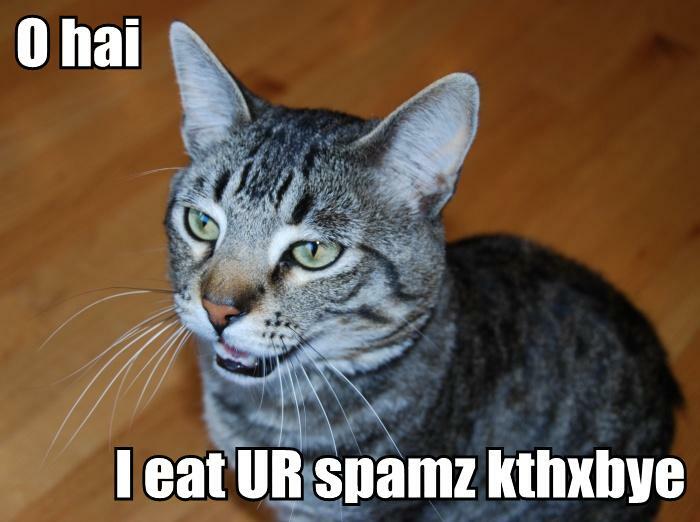 Brian, remix into lolcat form at will. 🙂 You’ve see the lolcat builder? Dr. David Klein, you worry me just a little. /pd, there used to be dog collars at the Google Store (I think). I’ll ask around. I don’t understand why anyone would prefer a cat over a dog. Can someone explain this to me? The only reason I can think of is maybe you want a low-maintenance pet? Other than that, what’s the point… cats don’t do anything. 90% of cats I’ve seen don’t even interact with their owners. The only reason I would ever own a cat is to give my dogs something to chew on. Hey Matt – you have very cute cats! Love the fact that one rests on your chest as you work! I was a dog owner (would rather have punted a cat) turned CAT-LOVER. My girlfriend wanted a cat – so I surprised her with a little black kitten named Cricket – and he is quite a character… got him when he could fit in the palm of your hand. Of course, he followed the non-cat person around and is now my best buddy. He sits between my arms while I type and even wakes me up in the night to ‘spoon’… what can I say…? and it’s easy to make it say anything, e.g. l’Optimiseur, I’m surprised you’d ask that question! Everyone knows that you have to have a cat in order to become an ultra-villain and control the world. Your Ozzie has a striking resemblance to my Tigger (sorry photo lacking). Does he like to open cupboards, dispell contents, and hide in them as well? Ozzie looks just like my cat Tiga (although Tiga is much fatter). She is also very vocal and streaks around like crazy. My husband calls her “Cracky” because he says she acts like she’s on crack. Thanks for letting us see your kitties! Nice cat, but I have to stick with my dog. He causes fewer allegeries. Although he does occasionally eat one of my shoes. And the winner Brian White for generating this one !! What is it with all these cats people? The more I try and ignore them, the more they taunt me. sweet.. that lolcat builder is nice. Going to have some fun with that. Mine’s awesome. She plays fetch, hide and seek, swims in the bathtub, and answers when you talk to her. I’ve almost got her trained to walk on a leash too. After that comes using the toilet instead of a litter box. During that time I invented and perfected a cool way to avoid scratches when transporting cats. You know those ‘knitted rugs’ that granny used to use on her rocking chair? Try and get hold of one. Should have plenty of holes in it, and be min 1m x 1m. Lay it out on the floor, flat. 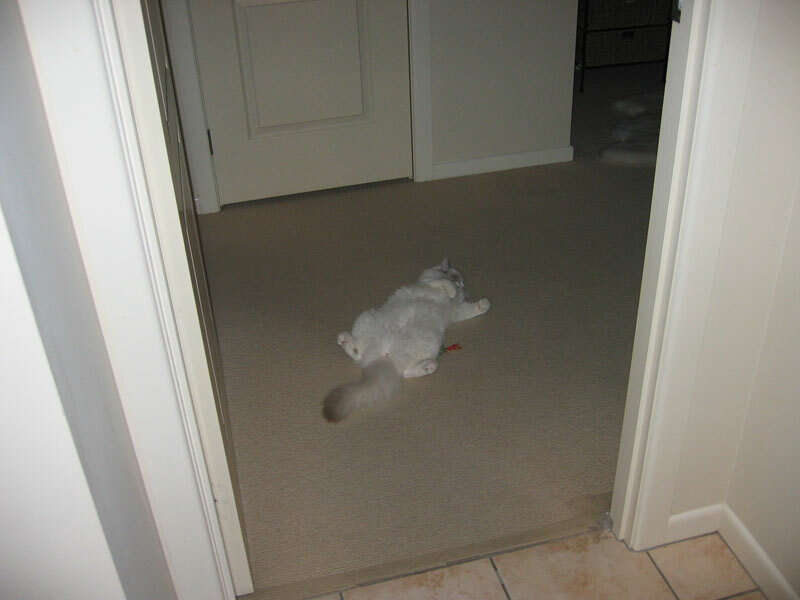 Take cat, position cat on one corner of the rug. Give cat a pat, and then tightly roll moggie in rug like a burrito. This makes the cat immobile, keeps him warm and comfy, lets him see and breath through the holes and is guaranteed to make your vet crack up laughing. Bad poll, bad poll. I have both cats and a dog. Must offer multiple options. I shutter to think that if you can’t get a simple pet poll right, what other mistakes are you making at Google? Sorry I’m so critical, but it’s a pretty basic thing. Many people have multiple pets. I do have a dog. most interesting, a friend of mine has a monkey as a pet. I had many but now no. Every website having one pet of its own, which can be managed (fully or partially) by the website owners (in collaboration with Google). How will that help? Hmm… Improved crawling for advance users. Afterall a pet should be pet, not profitable always. It’s hard to admit to people I have 2 cats, it’s sort of emasculating. It my wife’s fault really! I’m a dog man but I moved to Florida and I think it’s just too hot for dogs. Cats are cool. Am I right in guessing you too are a fan of Dean Koontz’s “Odd Thomas”? Only other possibility I can think of is that Ozzie was named after the well-known Brummie musician. Slightly surprised that no-one else has theorised about the origin of your pet’s name yet. I really like your cat, I had 11 cats before two of them have been crashed by a train and 3 of them mysteriously disappeared. Now I have 6 of them and I can say that cats are animal that is easiest to take care of. Dog brings very big responsibility and looking after him whole time. I had a dog too two years ago and I can say that taking care of 11 cats is lot easier that taking care of one dog. I have a Budgie. William is his name. Cats are a big problem for wildlife in Australia. I rescued a small possum recently that was being harassed by a cat. Matt – You got pet insurance for your talking felines? Thats a good Image, cats can be such fickle subjects. Googlebots are nice if you have a hair allergy, but they want to eat different things on a regular basis. The other day all we had in the pantry was a can of spam and now our Googlebot hasn’t returned in a few weeks. We made a sitemap and posted it on some telephone poles but there has been no update so far. I don’t have an actual pet, but a virtual one. I recently read an article about my bank, Wells Fargo, in a story I discovered on http://www.webnewsblog.org/ and it talked about how they are going to be joining the Second Life realm. Well, I decided to check out Second Life as well. Long story short, I eventually acquired a pet dragon that follows me around! Why dont you have a button for Saltwater Fish? I have a reef tank that i love..haha….I dont like the smell of crap so it works for me.. But if I did have a cat, i would like a grey one with blue eyes….. I think the google web history feature should be turned off by default. I have a dog, The Baron Earl. Baron is a 1 year old Bichon that also give his “ruff view” on what he likes to look for in a home. Lol. Its tough to get pictures of cats. I mean, I had a cat when I was 10 years old and I believed that it is the cutest in the world. But, I can’t take a picture of it to show off !! Bad. Hmm, I like cats, but I’m allergic to animal hair, so – no cat for Tobsy. On this picture I’m not sure what to say. Either “Oh, he’s cute :-)” or “Uhm, he looks scary. Does he eat fat German dudes?”. Pick one *g*. Still love dogs, had them for most of my early years. I love dogs.but I don’t have a dog. I love dogs very much and I am even trying to do some business in dog clothing! I only care for ducks, they are the coolest animals on the planet. My cat has the same colouring, she even has her own blog and myspace page! Ozzie’s a handsome little guy. I have two male cats, two female cats, and an invisible bulldog named Duchess. Ozzie is quite a poser!My cat Spot is a sleeper and his best friend is rottweiler Xing! Your poll should have checkboxes! Some of us have dog(s) and cat(s)! I don’t know why, but cat seems a “careless” creature to me. While dog responds to all your emotions. May be I am love “hungry” guy, but it is really hard for me to hug a cat while she seems very careless about “Hug”. We can safely assume that cats are the IT industries friends then? I am missing animal company at the moment as my girlfriend is scared of all animals……. except me of course!